Greenland, Antarctic Ice Is Melting Faster The good news: Sea level has risen by just a half-inch in the past 20 years as a result of shrinking ice. The bad news: The melting is now speeding up. Over the next century, this could contribute to another 2- to 3-foot rise in sea level — enough to flood New York City every few years. Superstorm Sandy sparked a lot of interest in rising sea levels when it swept across the Northeast last month and flooded parts of the coast. Over the next century, more water — and higher sea levels — could come from melting ice in Greenland and Antarctica. How much has been unclear. But now scientists have developed a much clearer view of how quickly that ice has been melting over the past two decades. And that will help researchers forecast the rate of sea-level rise in the years to come. There's enough ice sitting on Greenland and Antarctica to drive up sea level catastrophically — by more than 200 feet. Thankfully, nobody expects it all to melt. 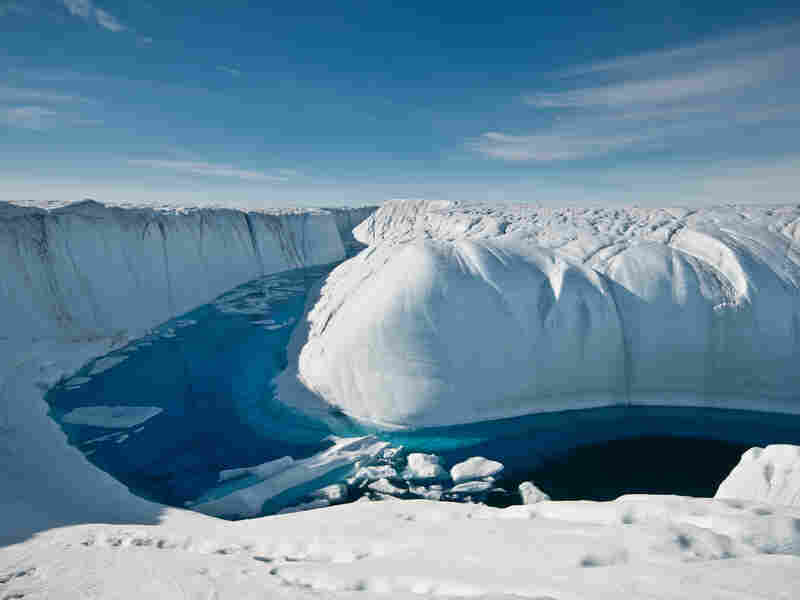 But over the past two decades, scientists have been struggling to understand just what has been happening on those ice sheets, using primarily satellite-based instruments. "There are three different techniques," says Andy Shepherd at the University of Leeds in the U.K. "The oldest is called altimetry. It's the same sort of instrument an airplane carries to tell how high it is above the ground." Satellites also measure the flow of giant glaciers as they stream toward the sea. And a third technique measures tiny changes in gravity, which is a way to measure the mass of ice in those sheets. But these three different techniques didn't provide one clear answer. So Shepherd brought together all the world's experts on this topic to resolve many of the discrepancies. It's a tricky business. Ice isn't simply behaving as a monolith. For example, ice in some parts of Antarctica is growing, because warmer air holds more moisture and leads to more snowfall. But other parts are melting as warm seawater eats away at the edges. "It wasn't clear because of the uncertainty of the data whether the ice sheet was growing or shrinking," Shepherd says. "And now we're able to say with confidence, over all that time period, that it was shrinking." Greenland's ice has also been shrinking. And when the researchers put all their data together, they found that Antarctica and Greenland together have melted enough over the past 20 years to raise sea level a very modest amount: about half an inch. They published their results in Science magazine. For several summers this deeply incised melt channel transported overflow from a large melt lake to a moulin, a conduit that drains the water through many hundreds of feet to the ice sheet's bed. If you want to let out a sigh of relief, Shepherd says go ahead. "My job is to tell people good and bad news. 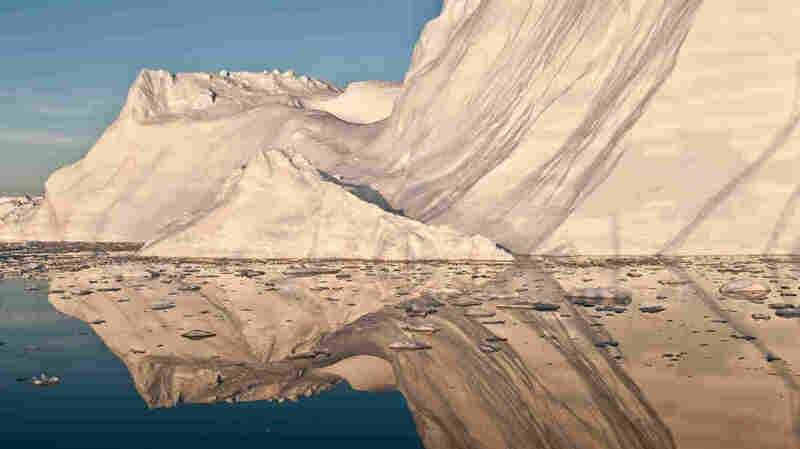 And if the ice sheets have not made a huge contribution to sea level, then I think people ought to be happy about that." But don't relax too much. Ian Joughin, a co-author of the study at the University of Washington, says the melting of these giant ice sheets has accelerated rapidly in recent years as the Earth has warmed, "and that's a big cause for concern. What we really don't know is how much [melt rates] are going to continue to go up." Scientists are now feeling more confident about being able to measure change as it happens. But figuring out what the ice is going to do is difficult. The biggest wild card is what will happen to some huge glaciers in Greenland and Antarctica that, in just a few years, have picked up a lot of speed as they flowed into the sea. "Unfortunately, there's a lot we still don't understand about the various processes that are controlling the fast ice flow, and how fast icebergs are discharged to the ocean," Joughin says. These surges appear to be driven by ever-warming seawater, which is flowing under the edge of the ice sheets, eating away at them from below. "In Antarctica, this is really most of the melting that goes on," Joughin says. "And as climate warms and more warm water comes in contact with these ice shelves, it tends to thin them and potentially break them up." The big question is how quickly this will happen in the coming decades. Scientists at one point thought the ice could melt catastrophically, adding more than 10 feet to sea level in the course of a century or so. Now, the experts in this field are thinking that sea level is much more likely to rise 2 or 3 feet by the end of the century. That includes additional sea-level rise from melting mountain glaciers and from the ocean itself, which expands as the water heats up. And 3 feet (about 1 meter) is a lot. "What today is a once-in-a-century storm surge event in New York City would happen every three years if you had a 1-meter rise in sea level," says Stefan Rahmstorf at the Potsdam Institute for Climate Impact Research near Berlin. "So a 1-meter sea level rise is huge." And it's by no means the end of the story. As long as the Earth keeps warming, the seas will keep on rising.